Exciting and Effective Personal Training Boot Camp Will Get You Fitter Faster. 18 Training sessions £720, save £180. Tired of curling weights and spending hours on the treadmill starring at the wall with little or no gain? Looking for exciting personal training with a difference that will get you results fast, that will help you to lose weight, tone up, put on lean muscle and get you fitter faster. Then its time to get your gloves on and get Boxing. With our 6 Week Boxing Boot Camp you will get 3 Personal Training Sessions per week at a time that suits you all at our fully equipped private personal training studio located in Winkfield, between Windsor and Ascot. 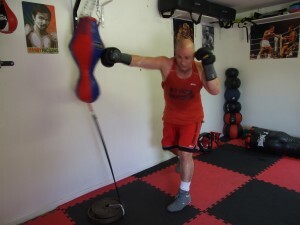 Boxing Training is one of the oldest and most effective training systems ever devised. With a typical session burning upto 1000 calories Boxing Training will turn your body into a calorie burning furnace. Boxing Fitness Training is great for both men and women of all ages and abilities i can cater for all ability levels from complete novice through to experienced Boxers all at our fully equipped private studio in Winkfield. Ex Army Boxer and Personal Trainer will get you into Championship shape with Boxing Personal Training, Come and train at our fully equipped Personal Training Studio and get into the best shape in your life.